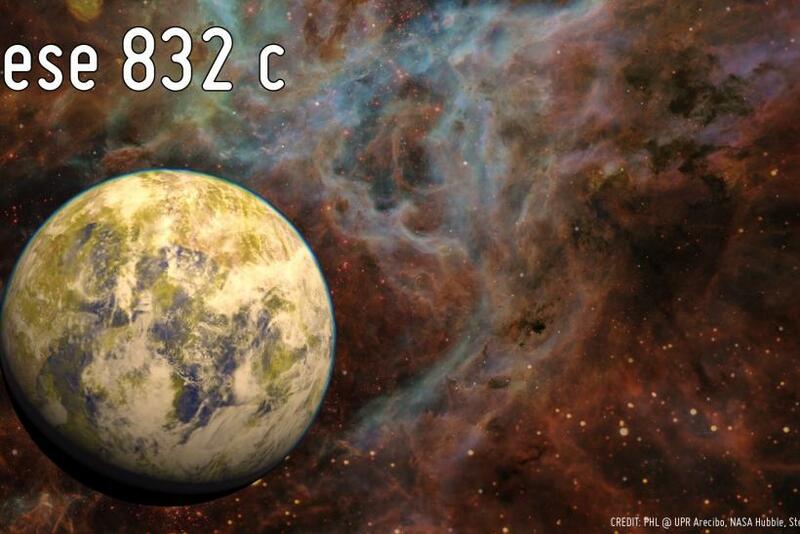 Artistic representation of the potentially habitable Super-Earth Gliese 832 c against a stellar nebula background. Photo: PHL @ UPR Arecibo, NASA Hubble, Stellarium. An international team of scientists has discovered a nearby planet that could be a potential candidate to host a habitable world similar to the one found on Earth. The planet, dubbed Gliese 832c, was found orbiting a red-dwarf star about 16 light-years away and has been added to a catalog of 23 habitable exoplanets. While Gliese 832c has a mass more than five times that of Earth’s, the star called Gliese 832 is half the mass and radius of the sun, according to scientists. “With an outer giant planet and an interior, potentially rocky planet, the GJ 832 planetary system can be thought of as a miniature version of our own Solar system,” the scientists wrote in the study, accepted for publication in The Astrophysical Journal. The Gliese 832c completes one orbit around its star in 36 days and it receives about the same average energy as Earth does from the sun. Scientists believe that the planet could have an Earth-like temperature, but with large seasonal shifts, if it possesses a similar terrestrial atmosphere. However, “a denser atmosphere, something expected for Super-Earths, could easily make this planet too hot for life and a ‘Super-Venus’ instead,” scientists said, in a statement. According to scientists, Gliese 832c is the second planet to be discovered around the star Gliese 832. The other one was Gliese 832b, a Jupiter-like gas giant that was found in 2009. In April, NASA announced the discovery of Kepler-186f, an exoplanet about the same size as Earth and located at an ideal distance from its host star to contain liquid water. The space agency said that among all the exoplanets that Kepler has spotted since its launch in 2009, Kepler-186f is the closest one yet to potentially support alien life.